EU BMR: larger impacts than Brexit for financial institutions? The last decade has seen a torrent of new financial regulations trying to improve markets’ stability and conduct mainly due to 2008 global financial crisis but not only. Among other factors that triggered this regulatory wave, you also need to mention few financial scandals, including the London Interbank Offered Rate (respectively LIBOR) rigging episodes that led to unprecedented penalties for banks and saw the creation of the EU BMR to address conflicts of interest involved. An interbank offered rate is a benchmark rate that represents the interest rate at which banks offer to lend funds to one another in the international interbank market for short-term loans. The process of producing such daily interest rates begins by asking the panel (between 11 to 16 banks contributors) the rate which they are willing to lend to other financial institutions. After they provide their desired rates, the contributions are listed in top-down order. Then, what follows is the elimination of outliers, which involves removal of 25% in the higher and lower contributions. Once they eliminate the outliers, the remaining rates are averaged and rounded to five decimal places. The process generally, is repeated across five currencies for each rate maturity to produce a total of 35 LIBORs. Scandal blew up when evidences showed traders openly asking others to set rates at a specific amount so that a position would be profitable. Regulators in both the United States and United Kingdom levied roughly $9 billion in fines on banks. Because LIBOR is used in the pricing of many financial instruments (see charts below), corporations and governments have also filed lawsuits, alleging that the rate fixing negatively affected them. Consequently, the European Union drafted a regulation on indices used as benchmarks in financial instruments and financial contracts (EU BMR) in September 2013 that will enforce as of the 1st of January 2020 for new contracts. Only benchmarks that are compliant with the new regulation must be used by EU firms in new contracts, introducing new compliance requirements for persons involved in the provision, contribution, and use of benchmarks to prevent any manipulation and to ensure maximum harmonisation in cross-border applications by developing Alternate Reference Rates (ARRs) (see chart below). As a consequence, Bank of England (BOE) decided that the Sterling LIBOR will be transitioned towards of a term rate based on current Sterling Over Night Index Average (SONIA) across sterling markets. SONIA rate already exists, has a term structure, is active, liquid and used in underlying markets (OIS markets). It tracks Bank rate very closely plus the average value of transactions underpinning SONIA since April 2018 is roughly £45bn per day. What main challenges do BMR bring to financial institutions? The BMR timelines are clearly challenging including huge amount of work from a legal (contract repapering) and operational (Front-to-back workflows) transition point of view but not only. Important changes will sit in valuation, risk management processes and infrastructure. From the perspective of market participants, they will need to get ready to operate in an environment with both legacy (IBORs) and new rates (ARRs) side by side but also to deal with an IBOR cessation event with several affected contracts in a short time period. As IBORs rates are based on unsecured lending, they include bank credit spread premium which are not included in ARRs, making their value different (see chart below). Hence, this structural difference will lead the ARR-IBOR basis risk that will need to be measured and managed to avoid significant moves in market values by determining appropriate spreads to be applied to ARRs and could also lead to reputational risk. Also, with IBORs being discontinued shortly and derivatives liquidity being moved to other benchmarks, firms may need to reassess their ALM hedging strategies and limits to manage the possibility of increased asset-liability risk arising from asymmetry in bank credit spreads in asset, liability and hedge products. To fully understand what sort of valuation risk a firm is exposed to, a rigorous and concise assessment of model inventory will need to be done in order to track all types of IBORs being used. The Libor-dependent world should start actively to work on these transitions. 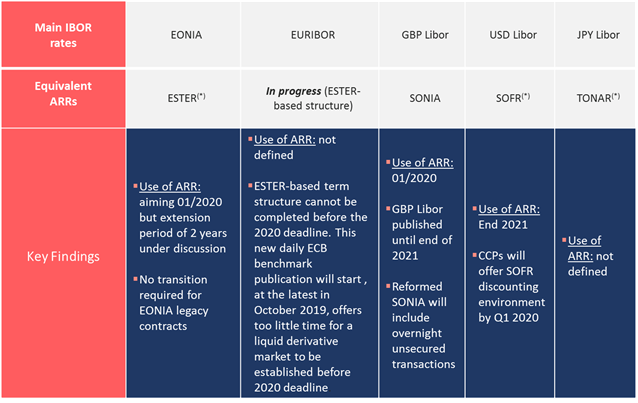 Some larger derivatives players already started but most of the $750Tn of existing legacy LIBOR products is not there yet. According to the FT, risk management consultancy JCRA and law firm Travers Smith said that 83% of financial institutions companies had not yet started making changes to their contracts ahead of the death of Libor, which is scheduled for the end of 2021 as the FCA has secured panel bank support to continue submitting to LIBOR till. Beyond this date the future of LIBOR and related contracts is not guaranteed.